Railpictures.ca - A.W.Mooney Photo: Back in the summer of 1974 on a beautiful day we see CN 4569, 4592 and 5050 westbound past the location of the old Paris station. This image was taken from the side of John St where it passes over the CN main. The end of train caboose is barely visible on the other side of the huge Grand River bridge, a Paris landmark. | Railpictures.ca – Canadian Railway Photography – photographie ferroviaire Canadienne. 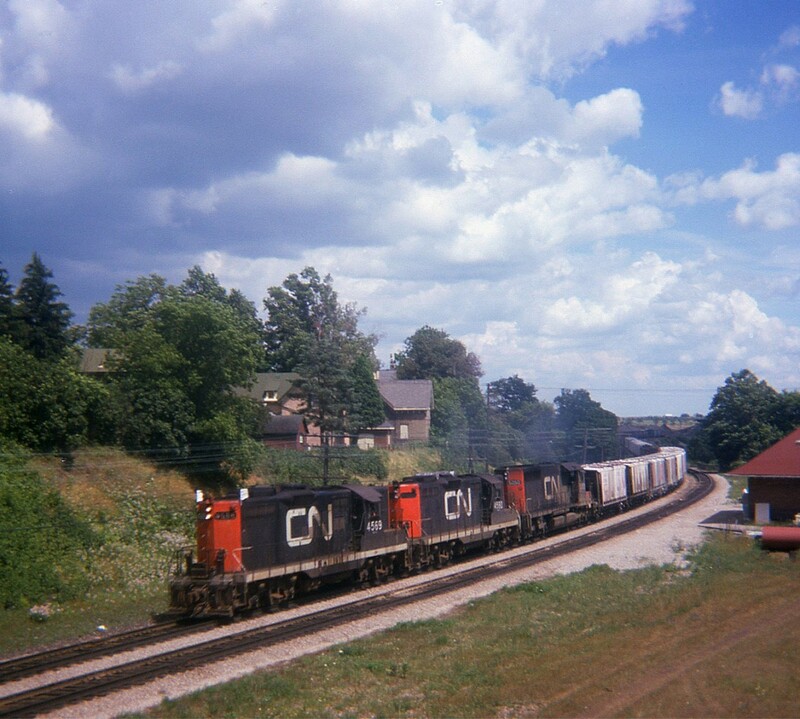 Caption: Back in the summer of 1974 on a beautiful day we see CN 4569, 4592 and 5050 westbound past the location of the old Paris station. This image was taken from the side of John St where it passes over the CN main. The end of train caboose is barely visible on the other side of the huge Grand River bridge, a Paris landmark. Thanks, Lad(s): Every time I look at these photos from around that era, they seem ‘dated’. And it is not just the power, its the whole scene. More peaceful somehow. And a lot less litter. (Where are all the Timmie Cups?0 We have evolved into a nation of slobs. Outstanding in today’s world, glad you were there to capture the typical scene from teh 1974 world.